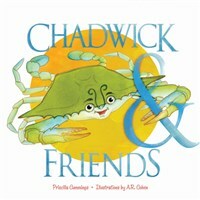 Chadwick the Crab and his friends—Bernie the Seagull, Hector Spector Jellyfish, Baron von Heron, Toulouse the Canada Goose, and Matilda Egret, to name a few—live in the Chesapeake Bay and share many adventures. Snuggle up with your youngest "readers" and introduce them to the Bay's most endearing crab and his buddies with fun rhymes and flaps that lift to reveal who's who. This delightful board book will increase language and identification skills, along with developing small motor skills and hand-eye coordination.